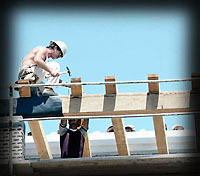 The Beyer Roofing Company has one of the best safety records in the roofing business. Our current Worker's Compensation Experience Modification of .072 is a result of our emphasis on safety. The link between safety and quality is one we stress to all our employees. Beyer Roofing Company carries more than the maximum amount of insurance to protect our employees and our company from liability claims that could occur during any job. The cost of this extra insurance is well worth the price should it ever be needed. Our safety procedures and programs are above the industry standards and we review these programs on a regular basis, updating whenever necessary. in its state-of-the-art storage buildings and out of the weather until it is needed so that it can perform safer and more reliably.